This photo was taken on April 14, 2017 at 8:20 AM. 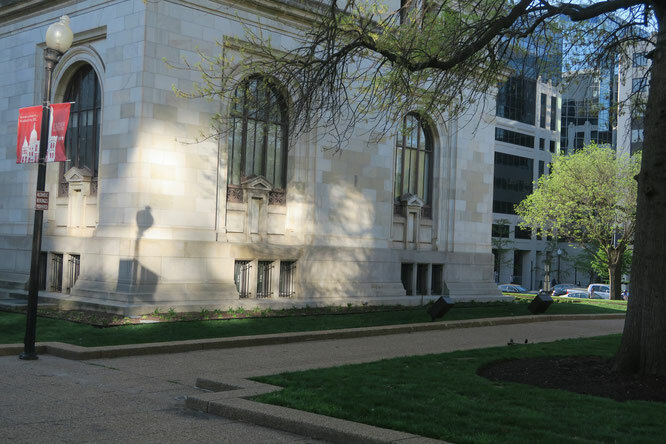 The Location was at the corner of a used to be, public library in downtown Washington DC. The "Take It!" came from my walking past this great shadow display on my way to a destination, and having it stick in my mind. On the way back, I stopped and took the sticker off of my brain in the form of taking this photograph. It was ever so random. The After Take: When at home looking at some of my random photos via my laptop, this one came up and upon closer viewing, I noticed the wobble top and the around the corner of the building the shadows from the small banners on each side of the lamp post. These two formerly unnoticed features kicked up the fun volume and elevated it into the Star rating. The unexpected fun sometimes lasts the longest. I saw the shadow first and thought somehow it distorted around the corner, then I noticed its actually bent. Somebody hit it with a Frisbee or a football. Ha ha! how strange is that? I wonder if it works. Oh wow, so you didn't notice that when you first took the photo? What was the initial thing that grabbed at you? My daughter said it looks like an elephant, although I have no flippin clue where she sees that. Well it has seen its better days, that's for sure.